Following on from my 'Happiness Post' last week I wanted to do a post today spreading the love. At the moment I'm sure we'll all agree that there just isn't enough of that being spread around at the moment. So today I wanted to do a post telling you about five bloggers who inspire me on a daily basis, whose blogs I love and who I really look up to. Keep on reading to find out who they are and why I admire them. Corrie never ever fails to make me laugh and smile. She's such a lovely girl and her blog is definitely one that inspires me and will always be a firm favorite of mine. Not only is she absolutely gorgeous but her quirky personality just shines through her blog so much as well. You feel like she's a friend talking to you and as a blogger I think that's such a great trait to have. Her posts are always full of light and happiness and even when she's having a down day and is sharing that on her blog you still smile as she's never negative and I absolutely love that. I talk about this girl all the time as it's only in the last year I've spoken to her and actually watched her youtube and blog grow. She inspires me so much when it comes to fitness and just being a better person. Her figure is gorgeous and she always posts about routines in the gym she has done and there is even a whole video on youtube showing you different workouts you can do which I absolutely love. Normally when I watch fitness videos I end up feeling just that little bit worse about myself because some can make you feel seriously patronizing. However Em does the complete opposite and is always super encouraging. I feel like when it comes to motivation Em's blog is definitely the blog to turn to. One of the loveliest bloggers I have ever spoken too is the lovely Kayleigh. Although I will admit recently I haven't really spoken to her purely because I've rarely been online and had the time to read blogs and because I know she's busy with uni too! However I still read her blog and I just love it. I love how she blogs about literally everything and how open and honest she is about certain situations and other things that she's been through as well. Some of the things she posts on her blog are just so important but is rarely stuff other bloggers post about and I think that's so inspiring that she has enough confidence to say 'I've gone through this and even though it's been tough other girls need to know this too'. I just love that attitude. She's just such a lovely girl and her honesty on her blog is definitely something that inspires me. When it comes to style and fashion Olivia is the number one blog for me to turn too. Her style is always incredible and her photos are just a massive inspiration for me. She's also such a lovely girl and I love keeping up to date with what she gets up to not only on her blog but on her snap chat too as she's always so cheerful and positive. I absolutely adore Meg and she is one person I really hope I get to meet one day. She definitely inspires me. I've been following her blog for a few years now and I've seen and read about struggles she has gone through in life which has been hard to read as it's so heartbreaking but she always makes up for it by posting about how she beat all the stuff she's gone through as well as offering advice to people who may be struggling through the same thing. She's one of the most beautiful, kind strongest people I've ever come across online and I really hope I get to meet her to thank her for helping me with my own confidence. I really loved writing this post. These girls are all such strong independent inspiring woman who definitely make this world a better place and I love finding their views and opinions on this as well as seeing how much they want to help others as well. If you're not already you should definitely check out their blogs and let me know in the comments what you think. If you already follow them and then inspire you too then be sure to let me know why as I'd love to know. 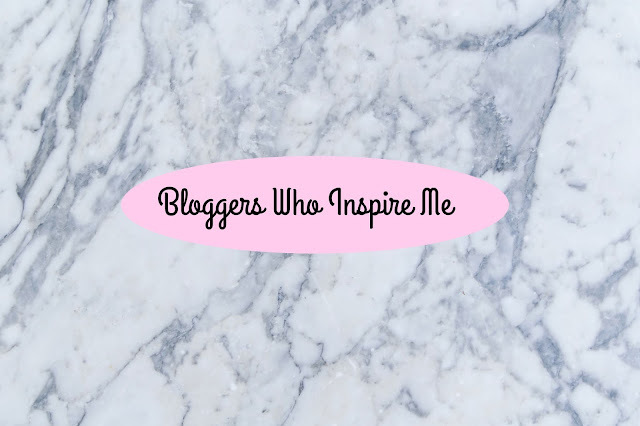 Are there any other bloggers who inspire you personally? Thanks for sharing, I follow some of these bloggers but never heard some of the blog mentioned here.